Woman and Guardian Angel, 1925, oil on canvas on board, 30 x 25 in. 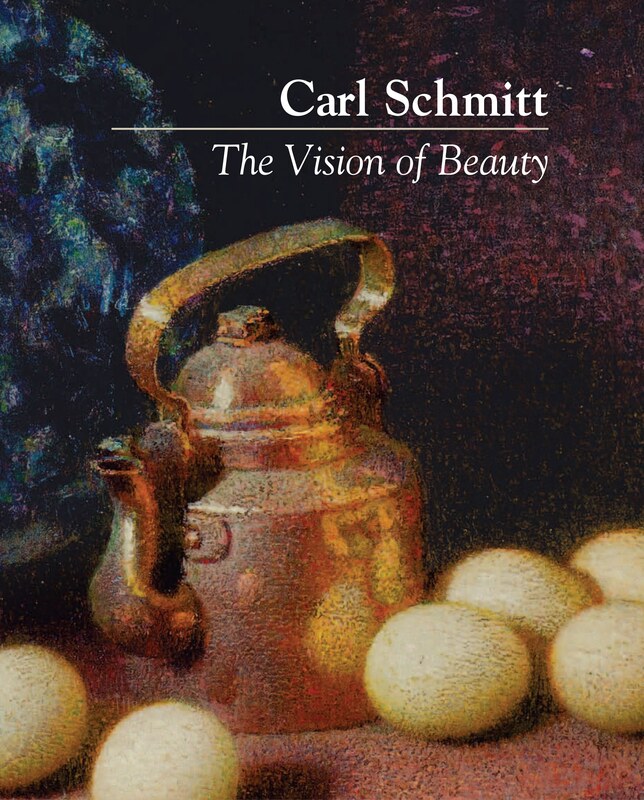 This warm and inviting painting, one of the most beguiling of Carl Schmitt’s “tapestry” style, was the result of many months of toil in the cold winter of 1924-25. Schmitt first mentions it his journal in early November, when he was busy at what would become one of his largest works, the mural Nativity, measuring 10 by 6 feet. The two works now hang side by side in the Foundation’s studio-gallery in Silvermine. 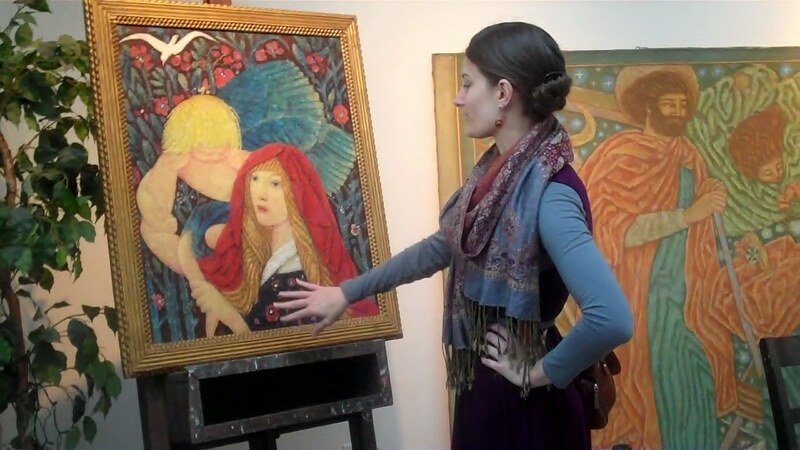 A friend of the CSF admires Woman and Guardian Angel, one of three works given to the Foundation in 2013. It is shown here in a frame by Carl’s brother Robert. The artist’s large canvas, Nativity, done at the same time, hangs in the background. If the great nineteenth-century painter Paul Cezanne, whom Schmitt admired for his dedication to form in painting, seemed disappointed that his art could not reach the level of sculpture, Schmitt seems determined to compensate for this loss. One sees in this painting the solid masses and bold forms of sculpture, but with the jewel-like colors that can be realized only in paint. The forms themselves also display a flexibility that stone or bronze could not easily withstand: witness the arm of the woman intertwined with that of the angel. Here the demands of three-dimensional form—not to mention the anatomy of the figures—bow to the overall design of the painting. It is not clear when the work was finally completed, since it was not exhibited in the artist’s lifetime. In 1932, the painting was bought by John Kenneth Byard, a longtime patron and friend of Schmitt. Byard gave it to his brother Dever, who passed it on to his son, and so on to his daughter, who gave it to the Foundation in 2013. This article appeared originally in the May 2014 issue of Vision, the CSF e-newsletter. If you would like to receive Vision in your inbox, you may subscribe here. 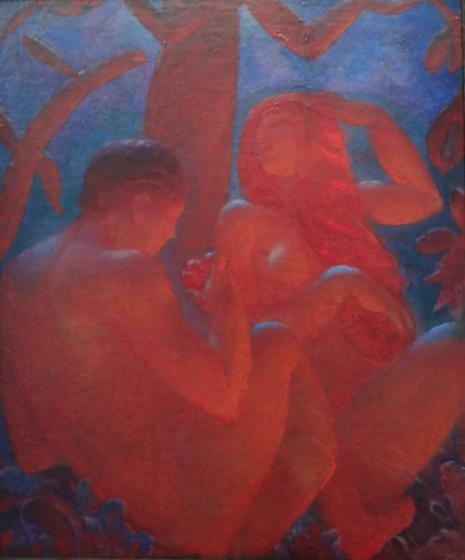 Immanent Trinity Decoration, 1924, oil on canvas, 48 x 40 in. Palace of Septimius Severus, Rome, pastel and wash on paper, 14 x 17 in., dated May 16, 1935.